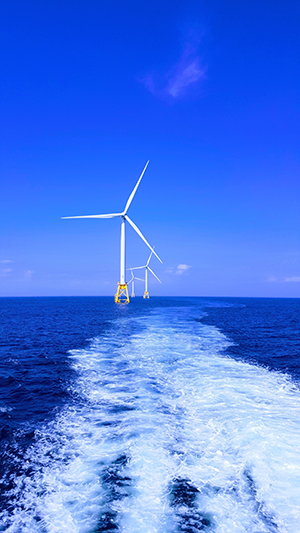 PNNL: Research Highlights: Wind and Wildlife Interactions: A World-Wide Solution Cannot Be "One Size Fits All"
Block Island Wind Farm is the U.S.'s first commercial offshore wind farm. The white paper addresses how wind energy stakeholders from around the world can work together to reduce scientific uncertainty around wind energy and wildlife interactions. Rather than employing a “one size fits all” approach, WREN studied the practice of adaptive management (AM) and how this method can be deployed for wind energy sites. The white paper defines AM as a decision process “that can be adjusted in the face of uncertainties” and describes it as “an interactive learning process.” The authors, including PNNL staff researchers Andrea Copping and Simon Geerlofs, chose to study AM because of its success in the areas of wetland management and other forms of renewable energy development. Implementing AM for wind energy allows stakeholders to pursue environmental research and wind energy projects simultaneously. Data gained from previous developments can inform new projects and can also be used to adjust the operation of existing projects. Using this method, real-world data are used to inform and modify wind power operations quickly. One example of this can be seen in Spain where operators monitor raptor flight using binoculars; their observations allow for the real-time shutdown of turbines to reduce collisions. After two years, mortality has decreased by 50 percent while power production has dropped minimally. Extensive research led the authors to recommend that AM should be considered on a large scale. This will provide regulators, wind energy developers, and researchers with a better understanding of various AM approaches. It will also allow them to effectively address environmental uncertainties in the future while simultaneously supporting an expanding wind energy industry. By improving AM for wind energy projects, scientific uncertainty can be reduced, and lessons learned can be applied to aid new wind energy development around the world. WREN is an initiative under the International Energy Agency Wind Committee and is led by wind energy experts in the U.S.; collaborators also come from ten other countries including Canada, France, Ireland, The Netherlands, Norway, Portugal, Spain, Sweden, Switzerland, and the United Kingdom. The full text white paper and a French translation of the fact sheet can be found on the Tethys website.